Bryan Termulo known as 'The Prince of Teleserye Theme Songs' made hit songs that maintain drama series of our country more memorable and relatable. Bryan having great voice, good looks and pure heart, nothing can stop him from stardom, especially now that he'll be having his first major concert. 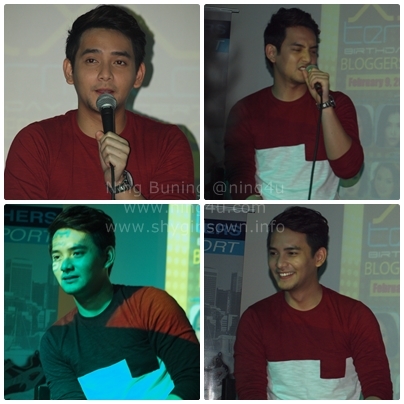 A bloggers conference happened recently at Insomia Bar Quezon City for Bryan Termulo's upcoming concert on March 9 a day after his birthday to celebrate his existence with his friends and supporters at the Music Museum 8PM entitled "Bryan XXV Termulo".With special guests Liezel Garcia, KZ Tandingan, Bugoy Drilon and Melai Cantiveros. Bryan welcomes bloggers with a song 'Dadalhin' from the phenomenal TV series 'Walang Hanggan' which he also got his biggest break in the industry. Bryan didn't get through, an easy way. From the time he enters the entertainment industry back in 2007, joining Pinoy Pop Superstar Year 3, Bryan never fails to give all of his heart to make people entertain by his singing (SOP) and even acting (as Dino in All My Life). Bryan being a Kapamilya makes him more visible because he continues singing and acting and become an ASAP 2012 mainstay every Sunday and sang theme songs of the famous TV series since then. Now he shared that he is very excited at the same time pressure because this will be his first concert, but he is thankful for all the blessings thrown his way. "First love ko talaga ang singing, so in celebration of my birthday with this concert, I am giving all it to them and maybe may konting dancing din" Bryan said with his boy next door smile. "But don't expect too much sa dancing ha, i don't really into dance..dance..but I know how to move" he added. Bryan also shared some things people around him didn't know or notice. He always left or misplace his things like his cellphone. The thing that drives me crazy is when he said that he cannot go out wearing an eyeliner in his eyebrows, "Sobrang manipis kasi ang kilay ko, so pag walang eyeliner as in parang wala talaga, so nasanay na ako maglagay since then palagi para okay" Bryan shared with a bog smile. Bryan also loves to travel a lot especially in the Philippines (Its More Fun In The Philippines indeed) most of the time with his family, "When me and my family travel in Coron, that's the most significant travel for me, but lahat naman memorable, maganda lang kasi ang Coron sobra" Bryan said with an excitement to go back there again. Bloggers really enjoyed that night with Bryan because he shares so many things and I can feel that he loves bloggers also, even in twitter (@bryantermulo) once we tap him he always response immediately especially around 10PM-12MN hehe.. and not only online writers but mostly to his friends and supporters who wishes him good luck everyday. Thank you so much to LionHearTV and Pinoy Magazine for inviting us, in my case for the 2nd time to be meet and greet Bryan. Bloggers Conference also brought by BWB Records and Music Production Inc., Erase Placenta, Lifeline, Cetaphil, Skechers, SOLO, Star Magic and Tambayan 101.9. Ticket Prices: 2,000 (VIP), 1,500, 1,200 and 800Php. You may call Ticketworld 891-9999 or Music Meseum 721-0635 and Teatrino 721-6726. VIP ticket holders will have a chance to "Meet and Greet" Bryan after the concert and a Limited Mini-Magazine of Bryan Termulo wherein vital information about him is all written there.